Note as of 13/11/18 a locked gate has been erected on both access roads. Please check Telegram/Facebook for up to date access information. A465 Take exit signposted A469 Bargoed / B4257 Rhymney. At the roundabout follow the A469 signposted to Pontlottyn, shortly after the turning for the B4257 on the left take the right turn signposted to Fochriw. Continue up the steep hill (Fochriw Road) for 0.7 miles, immediately over the cattle grid take the first left and follow the single-track lane 0.7 miles to take-off. Park along the edge of the track ensuring enough space is left for gliders landing or being carried forward across the track. A minimal carry to take-off. The take-off area is large and flat and the hill has a nice rounded front. No real obstructions, but be aware of the high voltage power lines running along the bottom of the hill in front of take-off. The paragliding top landing area A is large but be aware of being blown back onto the road and parked cars, also of gliders taking off ahead at the hill edge. Hang gliders should aim to land in area H1 towards the rear of the hill. Note the gentle slope towards the line of parked cars/road and take-off. Overshooting the landing area should be avoided but it is normally clearer towards the north end. Area H2 is large and reasonably flat and slightly higher than the road and car park. If you overshoot it is a long way to the front down a shallow slope towards take-off. Be aware of cars on the road, pilots taking off, PG’s landing and pilots soaring low at the hill edge. Area H3 on the shoulder is an option if you do not have enough height to be able to use H1 or H2. There is no safe overshoot option and you will need to land close to the road. It is worth taking note of the lay of the land on the way to take-off. If not staying up, head for the bottom landing (B) in good time as there are no alternative fields on the way if you get low. The bottom landing field (B) slopes uphill, so approach with plenty of airspeed. A “fly on the wall” type flare will be required on a hang glider. Quite a nice site to fly with a view over to Abertysswg. The Rhymney River sits in the valley below. Wave is not uncommon, and good height gains are possible even in winter. Lift drops off dramatically when the wind is off the hill. The site can be affected by a sea breeze – you’ll see the sea breeze front approaching from the south. It is possible to fly across the valley to the quarry and pick up lee side thermals from the rock face after it has been in sun. The wind turbines on the hills in front cannot be relied upon to judge wind speed as blades are adjusted to give slow rotation sometimes. Looking south from the Pontlottyn take-off. Photo courtesy of Alan Hole. Cars park immediately next to the landing area, so don’t get dragged into them, or land in their lee. 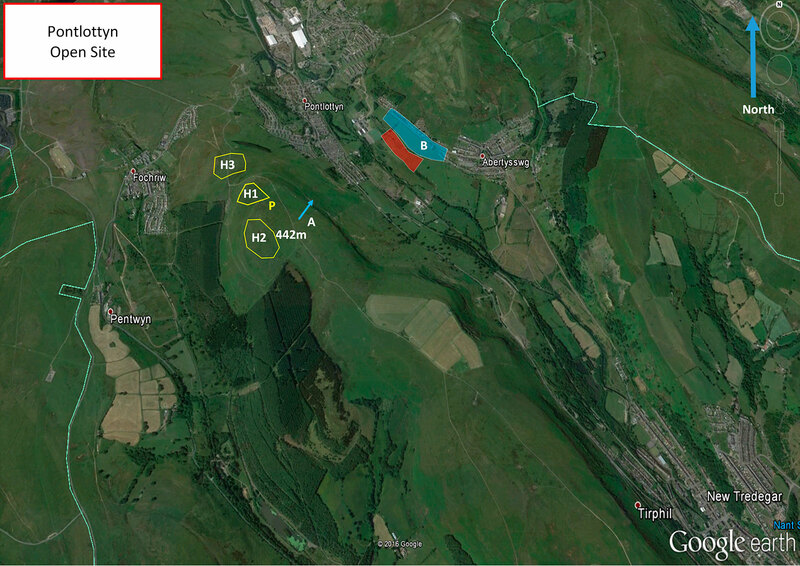 Open site – This site may be flown by suitably insured visiting hang glider & paraglider pilots. Norris Sheldon and Stuart Osmundsen flew just short of Bridgend from the site on the 6th April 2015. 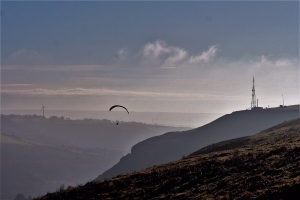 Flying over the South Wales valleys is quite a commitment and you run into airspace at about 29km. No track log was available for this flight. PG – Graham Richards flew 28.3 km on his Gradient Aspen 3 on 13 September 2009. Dial 999/112 and ask for the Police and then Mountain Rescue. If you are away from the road side then dial 999/112 and ask for the Police and then Mountain Rescue explaining your circumstances. If you cannot make voice calls, you can now contact the 999 Emergency Services by SMS. NB you must register this prior to an emergency.